Providing lots of analogue I/O for your DAW software has, in the past, generally involved expensive arrays of multiple interface and conversion units occupying many inches of rack space. However, in recent months I've noticed a distinct trend towards providing more generous I/O counts in smaller boxes — not least through the increasing adoption of large-scale formats like MADI and audio-over-IP. Antelope Audio's new Orion 32 interface is the latest — and, arguably, the most impressive — example to date of that fashion. In a nutshell, the Orion 32 manages to squeeze into a single 1U rackmount box 32 channels of analogue audio in and out, with a genuine two-way 32-channel USB 2 interface for your computer, supporting all standard sample rates from 32 to 192 kHz. Apparently, this is the world's first 32-channel, 1U USB interface, and the manufacturers have even managed to fit in a proper, internal, universal mains power supply! That brief description in itself will, I'm sure, be enough to whet some people's appetites, but Antelope have actually produced something even more impressive than a straight 32 I/O converter here. They've also included additional digital I/O in the form of 64 channels of optical MADI, 16 channels of ADAT (at base sample rates), and two channels of S/PDIF. Amazingly, that still wasn't enough for the ingenious folks at Antelope, because they also added their oven-stabilised crystal master-clock circuitry (using the company's proprietary 'Acoustically Focused' jitter technology), complete with an external 'atomic clock' reference input, and four word-clock distribution outputs to synchronise external equipment. Finally, just to add a blindingly red and shiny cherry to the top of a very thickly iced cake, the Orion is not only Windows and OS X-compatible, but works with iOS devices (via the camera connection kit for iPads) too, thanks to a custom USB interface chip. The huge analogue channel count is accommodated via D-sub connectors on the rear panel, as it would be impossible to fit in enough jacks or XLRs. There are impressive digital I/O options, too. The Orion 32's 1U rackmounting steel chassis extends about 200mm behind the rack ears, and weighs roughly 3kg. Despite the compact size of the case, its rear panel is laid out with sufficient spacing between the various connectors to let you plug and unplug individual items without upsetting everything else — though only just! The whole of the right-hand side is occupied by two rows of four 25-pin D-sub connectors, which are wired according to the newly standardised AES59 format (previously known as the Tascam format). Each D-sub socket carries eight channels of balanced line-level analogue audio, providing 32 channels in and out, in total, with a maximum level of +20dBu. Measuring the A-weighted AES17 dynamic-range performance for the A-D and D-A stages on an Audio Precision Analyser system, I achieved figures of around 116dB for both — which is quite respectable — and THD+N distortion of around -101dB for the A-D and -96dB for the D-A. Again, these are both good results. Towards the centre are two pairs of ADAT Toslink ports, providing up to 16 channels of ADAT digital audio in and out at base sample rates, and progressively fewer channels at higher sample rates through the use of the S/MUX protocol. Below these, a B-type USB 2 socket caters for connection with a computer, and the dual optical MADI port accommodates up to 64 channels in and out at base sample rates, 32 of which can be accessed via the USB interface. Again, the S/MUX protocol provides support for fewer channels at higher sample rates. The left-hand side of the back panel carries a pair of RCA/phono sockets for stereo S/PDIF in and out, and six BNC sockets. Four provide word-clock distribution outputs, while the other two provide external word-clock and '10M' atomic clock reference inputs. The final connector is the ubiquitous IEC power inlet, which accepts any mains voltage between 95 and 245V AC. The Orion 32 consumes up to 20W. The front panel is a very elegant affair, with a trapezoid smoked-Perspex wedge in the centre protecting the various information displays, along with a number of polished metal buttons and white LEDs on either side. A power-standby button occupies the farthest left position, followed by three LEDs to indicate the word-clock status (internal oven, external word clock, or 10M reference). Two more push buttons scroll through the available sample rates, the current setting being displayed on a red LED in the trapezoid section. A multi-function colour TFT display alongside provides text information during configuration, but spends most of its time as two rows of 32 bar-graph meters, the signals displayed on which are set up via the software control panel. Of the six push-buttons on the right-hand side, the first is the 'antelope' button, which is used to access various option modes. The other five buttons recall signal routing and clocking configuration presets. Pressing the antelope button with one of of the first three preset buttons restores the factory defaults, enters an atomic clock calibration mode, and displays the device's serial, hardware and firmware revision numbers. The firmware can be updated via the USB connection. Once set up, there isn't much physical interaction required with the Orion 32 hardware. Pre-configured signal routing arrangements can be recalled and the sample rate changed through the front-panel buttons if you wish, but all the clever stuff is controlled through a dedicated software control panel. The control software is as elegantly styled as the hardware unit, and includes a 'power button' in the top left-hand corner to toggle the hardware's standby mode. Two sets of 32-channel bar-graph meters occupy the top of the window, along with drop-down selectors for the viewed sources (ADC, USB replay, MADI in 1-32 and 33-64, ADAT, S/PDIF, Mixer L/R, DAC, USB record, MADI out 1-32 and 33-64, ADAT out, S/PDIF out, and mixer channels 1-32). The hardware meters reflect the same selections you've made in the software, and I'll come back to the mixer references shortly. One of the two faders located between the meter sections controls the brightness of the hardware display and LEDs, while the other adjusts the replay volume of all the D-A outputs simultaneously, and a group of buttons in the top right-hand corner accesses the Settings and Info panel. Amongst the Settings options is a facility to introduce a sample-rate converter on the S/PDIF input (to accommodate an external digital source running at a different sample rate to the Orion 32), and dual test oscillators with selectable frequencies (1kHz or 400Hz) and levels (0, -6, -12, -18dBFS and off). The number of audio channels passed over the USB interface can also be selected between the default 32 and 24 (which is necessary at quad sample rates with Macs), and the S/MUX mode engaged for the MADI ports when operating at elevated sample rates. The headroom margin for the A-D and D-A converters can also be adjusted independently in 1dB increments between -20dBFS and -14dBFS. The former is the default setting and the SMPTE standard, while -18dBFS is the EBU standard. The final options are for adjusting the ASIO buffer size (64 to 8192 samples) and streaming mode (minimum or low latency, standard, relaxed, safe and extra safe!). A 'Firmware Update' button does exactly what the label says. The Orion 32 is far more than just a USB interface. For example, it also acts as a routing matrix for the very generous analogue and digital I/O, as you can see in this screen from the control software. Below the meters on either side are two drop-down boxes to select the clock source (internal crystal, external references or digital inputs) and sample rate, with a duplication of the five preset configuration buttons in between. A routing/clocking configuration is saved by holding down the computer's Ctrl/Cmd key and clicking on the appropriate preset button. Thereafter, it can be recalled from the corresponding hardware or software preset button. The I/O routing is a simple drag-and-drop process, whereby the required 'from' channels are selected by clicking on them, and then dragged to the appropriate 'to' destination. The different sources are colour-coded to make it easier to see what's going on, and you can route any source to any number of destinations. The Orion 32 can therefore serve as a digital format converter and a straight A-D or D-A converter, as well as a USB computer interface. A second page of the control-panel window replaces the routing matrix with a simple digital 32-2 mixer, which is equipped with faders, and pan, mute and solo controls. The mixer can be used for low-latency monitoring (typically 1.5ms at base sample rates), as well as for general mixdown duties. The channel inputs can be selected from any of the Orion's 'from' sources, and the stereo output routed to any destination. Installing the ASIO driver and control panel on my Windows 7 64-bit test system was straightforward, and the Orion 32 performed flawlessly throughout the review period. At 44.1kHz, and with the minimum latency streaming mode selected (64 samples in this case), CEntrance ASIO latency tests revealed reliable analogue round-trip latency of 7.82ms through Reaper, reducing to 6.13ms at 96kHz, and these measurements were confirmed externally using an Audio Precision Analyser. It's worth mentioning that Antelope claim that lower latency is possible with other DAWs. Finally, I noticed that the generic WDM drivers were also available as an option in Reaper, which may open up the possibility of recording to an Android device, as well as the officially supported Windows, OS X and iOS systems. All in all, then, this is a very impressive package in every respect. It is very well built, has an integrated universal mains supply, and offers massive I/O capability with extremely versatile routing options. It measures well, technically, and it sounds very musical and clean. The analogue stages and converters have a hint of character, perhaps — a very subtle richness at the bottom end, maybe — but the mid-range is very neutral and precise, and the high end is clean and detailed. At under $50roughly £32 per converter channel, and with all its analogue and digital I/O and routing flexibility, the Orion offers seriously good performance at a very attractive price in a usefully compact format. It thus has to be placed very high on a prospective wish-list for anyone seeking a high analogue channel count from their interface. There are no alternatives with the same levels of I/O in such a small unit, or at such a high quality for the price. If size and cost are less important, there are several systems available which can be expanded via ADAT or MADI. 32 high-quality A-Ds and D-As in a 1U box. 32-channel USB I/O for Windows, OS X and iOS. MADI, ADAT and S/PDIF connectivity, with full signal routing. Macs can't support more than 24 channels over USB at quad sample rates. The Orion 32 is a reliable, superbly flexible, musical and remarkably cost-effective A-D/D-A converter and USB audio interface, which should appeal to anyone wanting an interface with a high channel count: nothing else packs so many channels of high-quality analogue I/O into a 1U rackmount case, but this one throws in extensive digital connectivity as well! Antelope Audio +1 415 869 9661. Windows 7 Pro 64 PC (Intel Q6700 quad core 2.6GHz, 8GB RAM), running Cockos Reaper v4.402 & SADiE v6.0.6. 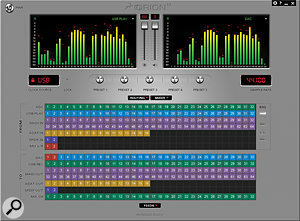 Orion 32 firmware v3.01, hardware 3.1, control panel v3.00.